Despite the advice to avoid white bread and opt for whole grain types, new research indicates that your best bet – for breakfast anyway – is white sourdough. The type of toast you eat for breakfast can affect how your body responds to lunch. Sourdough trumped even whole wheat bread in minimizing spikes in blood sugar among participants who ate sourdough in the morning, suggesting that sourdough can be beneficial for weight loss and managing diabetes. Read on to learn why sourdough is a top pick for part of your morning meal. 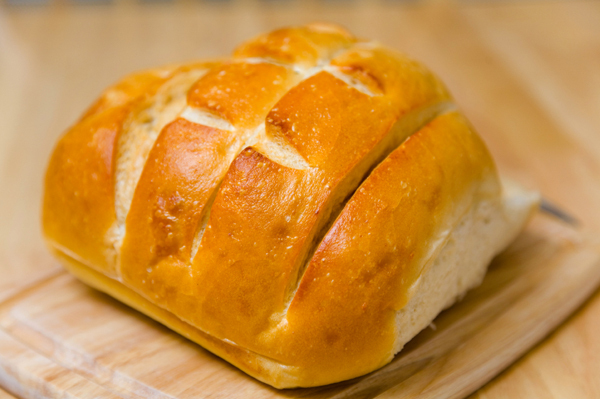 If you are making healthy diet choices, you are likely reaching for the whole wheat loaf when shopping for bread. However, that white sourdough round that you avoid could actually be a better choice. Researchers from the University of Guelph, in Ontario, Canada, tested the affect of white sourdough, regular white bread, whole wheat bread and whole wheat bread with barley on a group of overweight people aged 50 to 60 years old. “When the subjects ate the sourdough bread, they saw the least blood sugar and blood insulin response, which is a good thing,” says Terry Graham, professor in the Guelph human health and nutritional services department. Graham and a team of researchers examined how participants responded just hours after eating the bread for breakfast and again just hours after eating a standard lunch. “With the sourdough, the subjects’ blood sugar levels were lower for a similar rise in blood insulin,” says Graham, whose findings are to be published in the British Journal of Nutrition. According to Graham, it is likely that the fermentation of the sourdough changes the nature of the starches in the bread, creating a more beneficial bread. Why did whole wheat score so poorly? Graham explains that the less positive blood responses sparked by the whole wheat are likely due to the fact that the milling process involved in making the whole wheat bread (that was used in the study) is similar to that used for white bread. However, before you swear off your favorite whole wheat loaf, Graham says that not all whole wheat or whole grain breads are made this way. The results of this sourdough study have compelled Graham and a team of researchers to continue studying the healthy benefits of sourdough as well as whole grain bread. They are in hopes of finding the most optimal ingredients that would result in a bread with the healthiest benefits. In collaboration with Scarborough bakery Stonemill Bakehouse, they have developed a whole grain sourdough bread and are currently testing its long-term health benefits, as compared to a standard white bread. So stayed tuned for Graham’s findings. But in the meantime, give sourdough a toast in the morning and enjoy its distinctive wonderful flavor as well as its boon to your health. This Poached Egg and Turkey Sausage Crostini is the perfect example of a balanced breakfast featuring sourdough toasts!